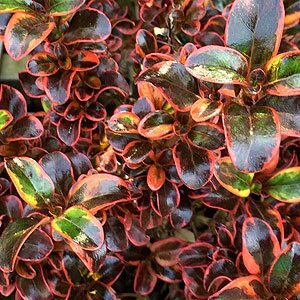 A plant that gives good foliage colour in winter, Coprosma come in many varieties. Most are small evergreen shrubs, and all are easy care. The botanical name is Coprosma repens, however it is the many cultivars that offer gardeners the best foliage colour. With names like Inferno, Rainbow Surprise, Evening Glow and Lemon and Lime you get an idea of the variety of foliage colours available. The foliage is glossy and rounded to oval shape, dense and the best colour is in winter. You can use these wonderful shrubs as feature foliage plats in the border, or even mass plant them. They grow well in containers and can also be used as a low, informal hedging plant. These are a fairly tidy, naturally bushy plant, and with small foliage they do take well to pruning. You can use many varieties to form a low hedge that will require pruning only once a year. You can prune them with secateurs or even hedging shears. The best time to prune is just before new growth begins in spring. Best planted in early spring or late summer. Dig the soil over well, add some well rotted compost and make sure the area is weed free. Give the new plant appropriate space, it will spread to around 1m over time. Plant at the same depth is was in the container. Fertilise with a general all purpose slow release fertiliser. Mulch around the plant to prevent weeds and retain a cool root run. Here we are looking at Coprosma repens cultivars. With so many available we have picked a few of the best varieties that are readily available for sale. Inferno – Green and orange in summer turning to reds and pink in winter. Rainbow Surprise – Cream and green in summer to pink in winter. Lemon and Lime – Lime green with yellow in summer, deeper yellows in winter. Pacific Sunset – One of the best red varieties. 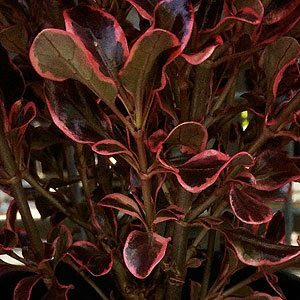 Pacific Sunset – Brilliant red and pink foliage. Tequila Sunrise – Green foliage turning to orange in winter. Frost tolerance – Very low, best in frost free areas. Fertiliser – General purpose slow release once a year. Pruning – Prune lightly to shape at the end of winter to early spring. Water requirements – Drought tolerant once established, however will perform better if water during dry summers.